The mobile and online channels are the future of customer authentication and fraud reduction. Boston, November 16, 2017 – Digital channels are attractive to North American financial institutions because the online and mobile channels enable FIs to offer products and services much more cheaply than in a branch or contact center environment, and they enable consumers and businesses to bank with them regardless of geographic location. But how can banks determine the identity of the party on the other side of the computer or smart device with all the data breaches, phishing attacks, and social engineering tactics as well as the growing malware threat? This report is a refresh of research published by Aite Group in 2015 and is part one in a two-part series. It will look at current fraud trends, how FIs protect digital channels, and planned technology investments to protect digital channels. 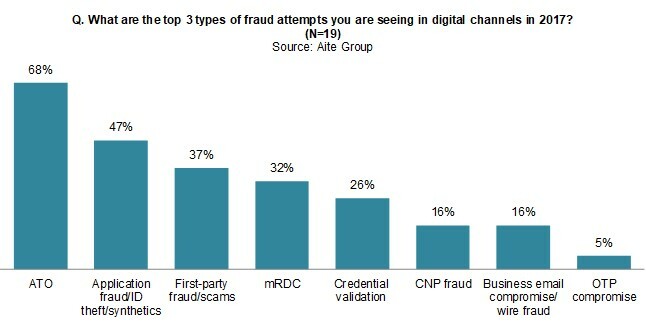 Aite Group conducted telephone interviews with 28 fraud and digital channel executives from 19 North American FIs that have more than US$25 billion in assets from July to September 2017. This 45-page Impact Report contains 37 figures and seven tables. Clients of Aite Group’s Retail Banking & Payments or Wholesale Banking & Payments service can download this report, the corresponding charts, and the Executive Impact Deck. This report mentions 41st Parameter, ACI Worldwide, Acxiom, Agnitio, AimBrain, American Express, Aware, BAE Systems, BehavioSec, BioConnect, BioCatch, Bottomline Technologies, Brighterion, Cardinal Commerce, DataVisor, Daon, DeltaID, Early Warning Services, Easy Solutions, Encap Security, Entersekt, Entrust Datacard, Equifax, Experian, EyeVerify, Facebanx, Feature Analytics, Feedzai, FICO, FIS, Fiserv, Fujitsu, Gemalto, GreenKey, Guardian Analytics, HID Global, Hitachi, Hypr, IBM, ID Analytics, IdentityMind, IDology, InAuth, Intellinx, iovation, iSoft, Jack Henry, Kofax, Kount, LexisNexis Risk Solutions, Mastercard, Microsoft, NEC, NeuroID, Neustar, NICE Actimize, NICE Systems, Nok Nok Labs, Nuance, NuData Security, Nymi, Oberthur Technologies, OneVisage, Oracle, OT-Morpho, Pindrop Security, Risk Ident, RSA Security, SAS, SayPay Technologies, SecuredTouch, SecureKey, Sensory Technologies, Sestek, Simility, Symantec, TeleSign, ThetaRay, ThreatMetrix, TransUnion, Trusona, TRUSTID, Validsoft, Vasco, Verint Systems, Voice Biometrics Group, VoicePIN, VoiceVault, and Wipro.